Fish Oil seems like a good item but i cant tell if it is as strong as other fish oils i have taken. I have been using Fish Oil (Fresh Catch) Omega-3 EPA/DHA for some time now and have to say they are the best fish oil ever. I love the price too! Fish Oil (Fresh Catch) Omega-3 EPA/DHA tablets are large but this one was smaller than others we have purchased. Does not leave a bad after taste either. Fresh Catch® Fish Oil softgels are ideal for people who are seeking the absolute highest-quality fish oil in convenient capsules. Ultra-purified‚ pharmaceutical grade and retained in its natural triglyceride form‚ our pure and pristine signature Fresh Catch® Fish Oil softgels provide a daily recommended dose of Omega-3. *Percent Daily Value (DV) are based on a 2‚000 calorie diet. 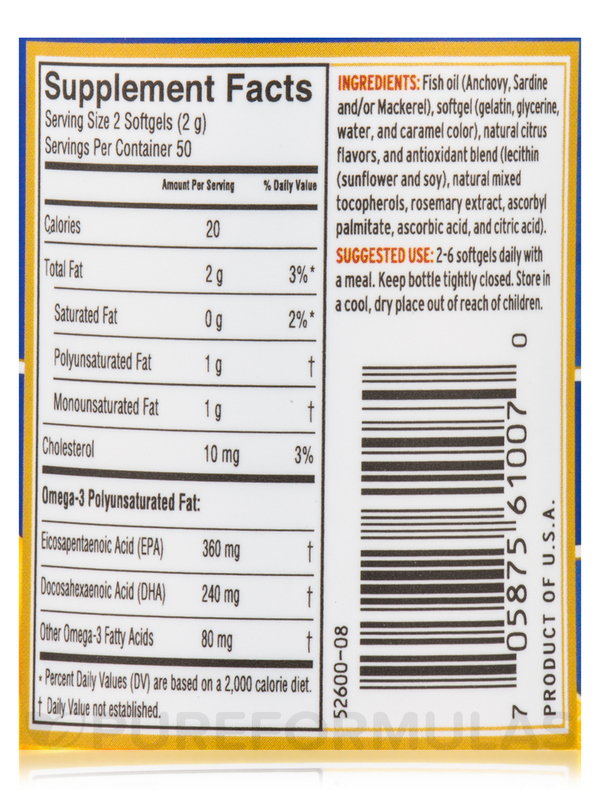 Ingredients: Fish oil (anchovy‚ sardine and/or mackerel)‚ softgel (gelatin‚ glycerine‚ water‚ and caramel color)‚ natural citrus flavors‚ and antioxidant blend (lecithin (sunflower and soy)‚ natural mixed tocopherols‚ rosemary extract‚ ascorbyl palmitate‚ ascorbic acid‚ and citric acid). 2-6 softgels daily with a meal. Store in a cool‚ dry place out of reach of children. Fresh Catch Fish Oil Omega-3 by Barlean's Organic Pleasant citrus aftertaste (not rancid at all--my doctor said to watch out for fish oil that has gone rancid; that won't be very good for you). Gel caps are large, but easy to swallow. Nice and clean taste. I think I am feeling benefits after using Fresh Catch Fish Oil Omega-3 only a few days. Awesome. And Barlean's Organic Oils has a long and solid reputation for quality. 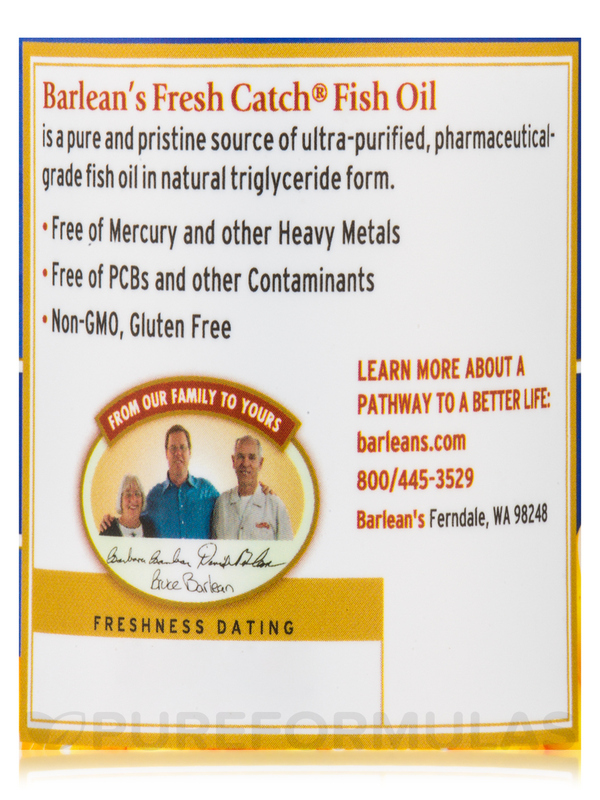 Fresh Catch Fish Oil Omega-3 EPA/DHA Orange 1000 mg by Barlean's Organic Oils is a good quality brand, at an excellent price. I like the orange flavor, because it doesn't cause that foul fish-burp thing that comes with regular fish oil. I'm very happy with this product. 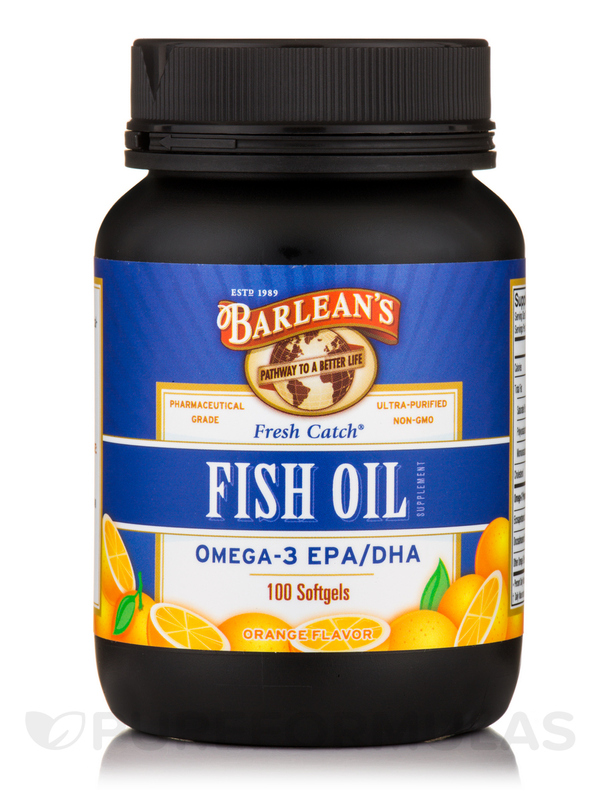 I ordered Fresh Catch Fish Oil Omega-3 EPA/DHA by Barleans Organic Oils because my Natural path doctor suggested that I take it during pregnancy. Fresh Catch Fish Oil did what I wanted it to. I would order this again, great price! Great price, and recommended by my doctor. Omega-3 EPA/DHA is a good source of Fish Oil. Great product. I has also used the liquid version of fresh catch fish oil. 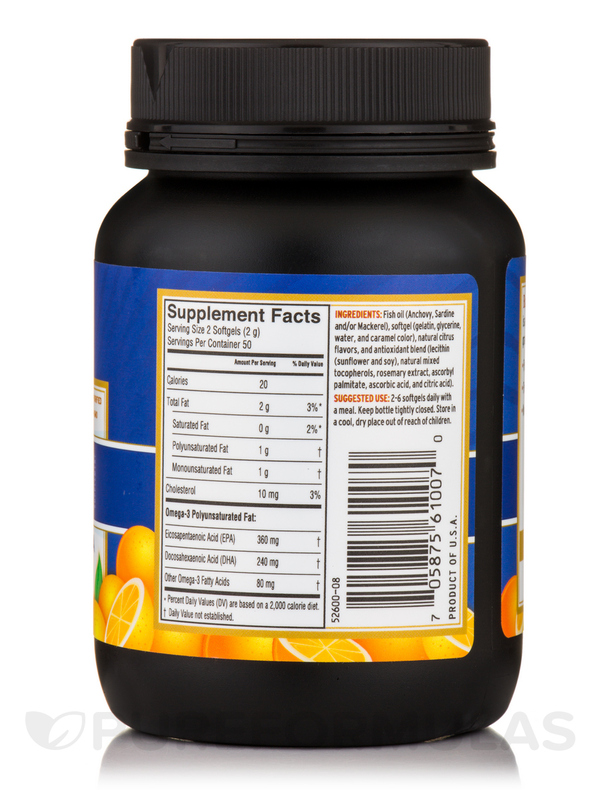 Fresh Catch Fish Oil Omega-3 EPA/DHA Orange 1000 mg by Barlean's Organic Oils tastes great. 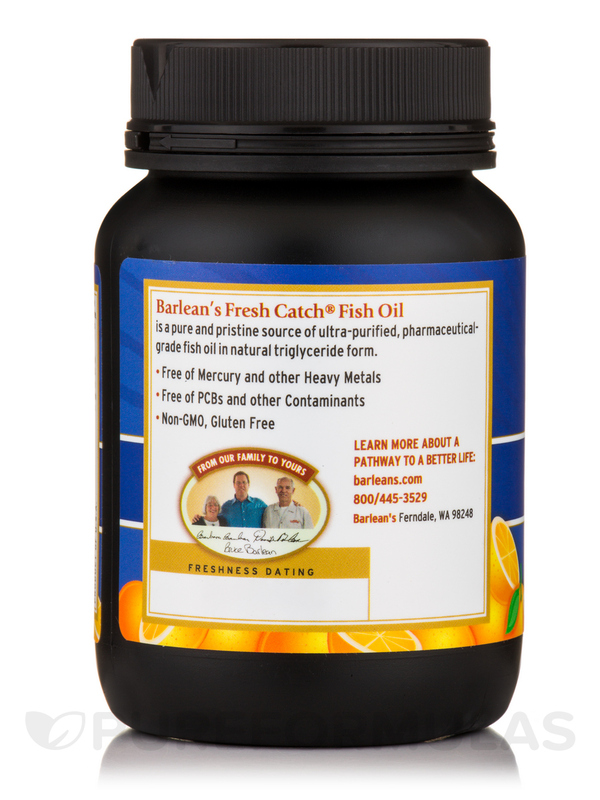 I trust the purity of Barleans fish oil and the fact that it has more EPA and DHA than many other brands.